Ready for some fresh fiction? Here are 10 fantastic books coming out this month. This year marks the fiftieth anniversary of the Oakland Athletics. Before the arrival of the Oakland A's, baseball in the town had withered to Little League and play on school yards. The Oakland Oaks franchise had outgrown its ball park in Emeryville by 1957. The team was dismantled and relocated to Vancouver, British Columbia, and rebranded the Vancouver Mounties. Charles O. Finley, a Chicago-based businessman, who had bought the Kansas City Athletics in 1960, was eager to leave Kansas City after a few short years because he felt the community did not offer the financial support or promotion he thought the team deserved. Major League Baseball officials denied Finley's efforts to relocate the team to a better market and forced him to sign a three-year lease, then a four-year lease. He also had a contentious relationship with the Kansas City press and with fans. AAMLO will like to take the time to acknowledge the birth one hundred years ago this month of former political prisoner and anti-apartheid leader Nelson Mandela. In 1963, Mandela was charged with sabotage against the South African government. He was convicted and given a life sentence in prison. On February 11, 1990, Nelson was released after spending 27 years in prison. On June 30, 1990, Mandela came to Oakland, California and spoke to a crowd of over 58,000 people at the Oakland Coliseum. This photo comes to you from our Archives Department. Several movies based on books are due for release in the coming months. If you haven't yet read the book, OPL has copies you can check out or place on hold. Here is a sampling of fall and summer movies based on books. African Americans have made significant contributions to the art of music in many genres. From gospel legends Shirley Ceasar, to Motown legends Diana Ross and the Supremes, Martha Reeves and the Vandellas and many more. The Bay Area has also produced many legends from Oakland born artist Sheila E., to rap/hip hop artists Too Short, M.C. Hammer, Digital Underground, and R&B artist Goapele. July is not holding back on the great new fiction releases. Time to place your holds! Check out the magic of local author and sci-fi phenom: Charlie Jane Anders. On the tippy-tail-end of Pride month, I'd like to highlight an amazing local author who's won a boatload of big awards: Charlie Jane Anders. 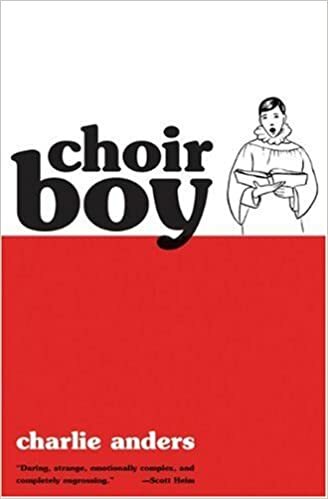 Charlie Jane is not only the winner of both the Nebula and Hugo awards, co-founder of io9.com, a site about science, sci-fi and the future, but also won the LAMBDA literary award with her first novel, Choir Boy! New LGBTQ books at OPL. Any time is a good time to read LGBTQ themed books, but since June is Pride month I'm taking this time to highlight these new titles released during 2018. Happy LGBTQ Pride Month and happy reading!